Condena is a band from Rosario, Santa Fe , Argentina. 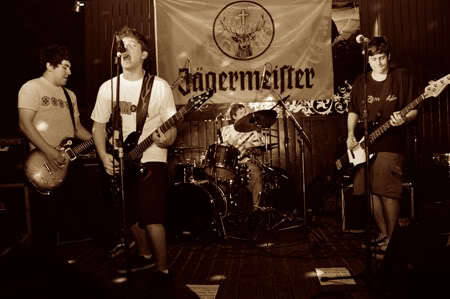 The band formed in 2006 and has been played in all sorts of small venues. In 2009 to open the show from the legendary band Down By Law during their visit to Rosario and presented for the first time in Buenos Aires with All the Hats. Their music is mainly influenced by punk rock bands such as Bad Religion, Rise Against, Ramones, Social Distortion, The Offspring, Sum41, Blink182 and Alkaline Trio, although Loey (singer, guitarist and driving force for most of the songs of Condena) does not deny his love for bands like Iron Maiden. Toti Garcia (bass) and Kolo (drums) are also part of the project since the beginning and Tommy (guitar) joined in 2008. With personal lyrics, ranging from anger to love in less than 1 second the sentiments of adolescence, to feel at times isolated from everything and completely immersed in a fantasy-personal reality: that is Condena. The band recently completed the process of recording, mixing and mastering of the songs that will be part of their first EP, entitled “Esto Puede Cambiar” and edited in digital format thanks to LEPORK RECORDS. The EP was recorded in Sonofotrón Studios and includes 5 tracks, with the support of GS Petrich (All the Hats) at the stage of gestation of the songs and Billie Gomez (ATH, C. Burana) who joined in the studio production. Both participated fully in the recording, directing the art production with Condena, recording vocals and guitar overdubs. Juan Ignacio Capella from The Leftouts adding his voice in some songs. This material shows a profound change in the direction of Condena, as a result of the search that started the band in pursuit of his own style. Condena are: Loey (vocals and guitar), Toti Garcia (bass and vocals), Tommy (guitar and vocals) Kolo ( drums).